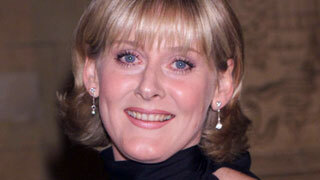 I’m looking forward to the return of Lark Rise to Candleford at the end of this month, especially as I’ve recently gained a new appreciation for the actress Sarah Lancashire, after seeing her as a police sergeant in the gritty crime thriller Happy Valley, which also starred Downton Abbey’s Miss O’Brien, Siobhan Finneran. It was only then that I realized I’d seen Lancashire years ago in London’s West End in one of my favorite musicals, Blood Brothers. The fifty year old Manchester born actress went straight to drama school after leaving high school. Initially she was interested in working behind the scenes, but her ambitions changed when she was accepted into the Guildhall School of Music and Drama. On graduating in 1986, she had a small walk-on part in Britain’s longest running soap opera, Coronation Street; a series her scriptwriter father had written for in the early days of the series. Siobhan Finneran and Lancashire in Happy Valley. Five years later, Lancashire returned to "the Street"; this time in a lead role. In the meantime, she had married a composer, had two children and spent a year performing in Blood Brothers; the show that Lancashire refers to as being her "big break". Unable to combine performing in the West End with raising her children in Manchester, Lancashire left the West End after Blood Brothers finished and returned to Manchester where she took a job teaching drama at Salford University. Even after being cast in Coronation Street, Lancashire felt it wise not to give up her day job, so she continued teaching for another year. Lancashire stayed with Coronation Street for five years, with a short break when she moved back to the south of London to appear as the title role of Rita in Educating Rita. Along with her departure from Coronation Street, Lancashire also split up from her husband and the actress began a new life as a single parent; a task that was made somewhat easier in 2000 when she became the first ever actress to be offered a two million dollar deal to appear exclusively on the BBC’s competing station, ITV. The deal made Lancashire the highest paid salaried actress in British Television. After her contract expired Lawrence had her third child with her second husband, producer Peter Salmon, whom she’d married in 2001. Lancashire and husband, Peter Salmon. After a break of eighteen months, when Lancashire returned to work it was as a director for the BBC; Lancashire finally realizing her ambition to work offstage rather than on. Ambition achieved, she then resumed her acting career. Almost two decades have now passed since Lancashire left Coronation Street and although she’s been in numerous television series, until the last couple of years, very few have been aired here in the U.S. Since 2012 though we’ve heard Lancashire as the adult voice of Laura Timmons in Lark Rise and have seen her as Miss Audrey in The Paradise and as Caroline in Last Tango in Halifax. 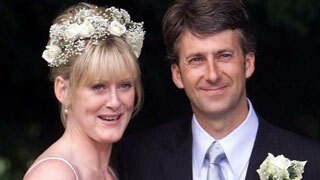 She also made a guest appearance in the penultimate episode of the 2010 Upstairs Downstairs revival series. Next up for Lancashire is a feature film; Dad’s Army. Based on the popular long running British sitcom written by David Croft which aired on the BBC from 1967 to 1977. The film version, which is scheduled for release in 2016, has an all-star cast. As well as Lancashire, it stars Bill Nighy, Sir Michael Gambon and Sir Tom Courtenay. Lark Rise to Candleford returns to Afternoon Tea weekdays at 1:30pm beginning January 26th. If you've got a favorite actor you'd like to know more about let me know, drop me a line.